There are many old libraries targeting the .NET Framework which, for various reasons, do not yet target .NET Core or .NET Standard. Topshelf, a fantastic library that helps you to easily create Windows services, is one of these. At the time of writing this article, the last release of Topshelf was 4.0.3 back in October 2016. There was no way that Topshelf could target .NET Standard because the .NET Standard spec did not support the APIs that are required for it to function. If you want to make a Windows service out of an application targeting .NET Core 1.1, then you have to use an alternative such as NSSM. With the release of .NET Core 2.0 and .NET Standard 2.0, applications or libraries targeting either of these are able to reference old libraries targeting the full .NET Framework. Presumably this is because the .NET Core/Standard 2.0 implementations have enough API coverage to overlap with what the full framework was able to offer. “You can now reference .NET Framework libraries from .NET Standard libraries using Visual Studio 2017 15.3. This feature helps you migrate .NET Framework code to .NET Standard or .NET Core over time (start with binaries and then move to source). It is also useful in the case that the source code is no longer accessible or is lost for a .NET Framework library, enabling it to be still be used in new scenarios. 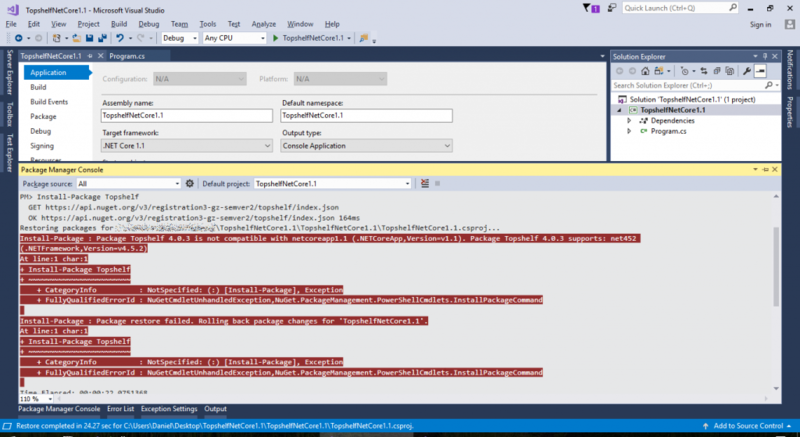 “We expect that this feature will be used most commonly from .NET Standard libraries. It also works for .NET Core apps and libraries. They can depend on .NET Framework libraries, too. 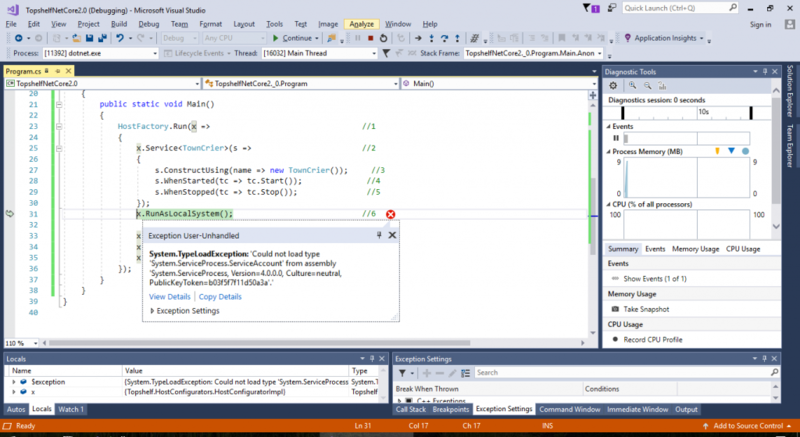 In order to actually test this out, you’ll need to have Visual Studio 15.3 or later. 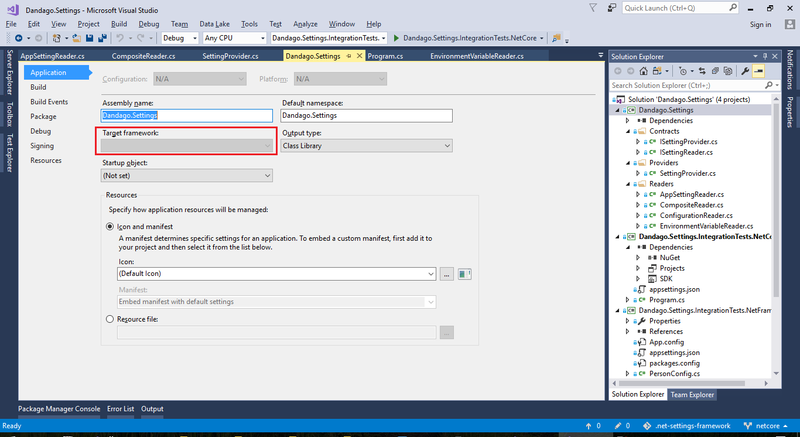 You will also need to separately install the .NET Core 2.0 SDK. There’s only one way to find out whether this will actually work in practice. Nope, looks like Topshelf won’t work even now. I guess the APIs supported by .NET Core 2.0 still do not have enough functionality for Topshelf work as-is. Other .NET Framework libraries may work though, depending on the dependencies they require. In the “.NET Core 2.0 Released!” video, one of the demos shows SharpZipLib 0.86 (last released in 2011) being installed in an ASP .NET Core 2.0 application. It is shown to build, but we don’t get to see whether it works at runtime. It is still early, and I suppose we have yet to learn more about the full extent of support for .NET Framework libraries from .NET Core 2.0 applications and .NET Standard 2.0 libraries. The problem is that when evaluating a third-party library such as Topshelf, it’s difficult to determine whether its own dependencies fall within the .NET Standard API set. This looks to me like a matter of pure trial and error. 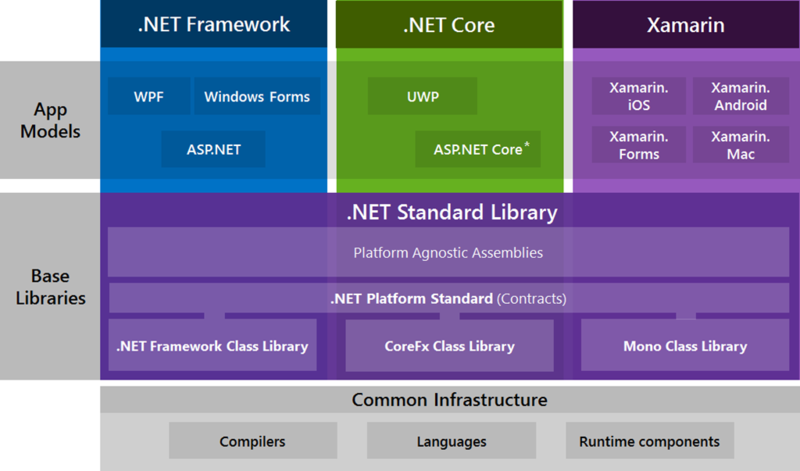 The .NET family has grown quite a bit, and to be honest, it’s a bit of a confusing mess. As I already explained in “Migrating Dandago.Finance to .NET Core“, there are now several different types of class library you can choose from (including different kinds of portable class libraries), different ideas of cross-platform (.NET Core vs Universal Windows Platform), different frameworks, and .NET Standard. Your applications will typically be built for one of the frameworks on top (e.g. .NET Framework). 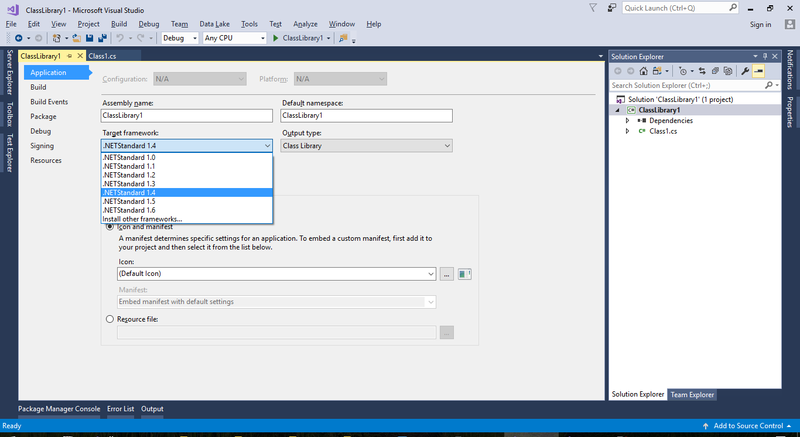 But when you create a class library, you can choose to have it target a specific framework, or .NET Standard. Just as a quick recap from “Migrating Dandago.Finance to .NET Core“, targeting a particular framework (e.g. .NET Core) will not let you use the class library on others (e.g. .NET Framework), but targeting .NET Standard keeps it compatible with all of them. This means that class libraries that target .NET Standard have maximum compatibility, but there’s a cost: not all APIs are available for .NET Standard, and targeting .NET Standard is only compatible with certain recent versions of those frameworks. If you take a look at the compatibility chart, you’ll notice for instance that .NET Standard 1.3 supports .NET Framework 4.6 and onwards. For the most part, this is okay. But sometimes, you may want to combine .NET Standard compatibility with specific features in a particular framework, or perhaps target .NET Standard but still support older versions of a framework because you have some legacy code you can’t upgrade yet. In this project, I’m targeting .NET Standard to provide as much compatibility as possible, but I’m also using framework-specific assets from the .NET Framework (namely System.Configuration, which is used to work with App.config/Web.config files). Thus, I am targeting both .NET Standard 1.2+ and .NET 4.5.2+. This has the effect of creating separate builds for each framework. Targeting .NET Core lets you go cross platform, but you can’t use that functionality with other frameworks. Targeting .NET Standard is compatible with any framework that supports that version of .NET Standard. 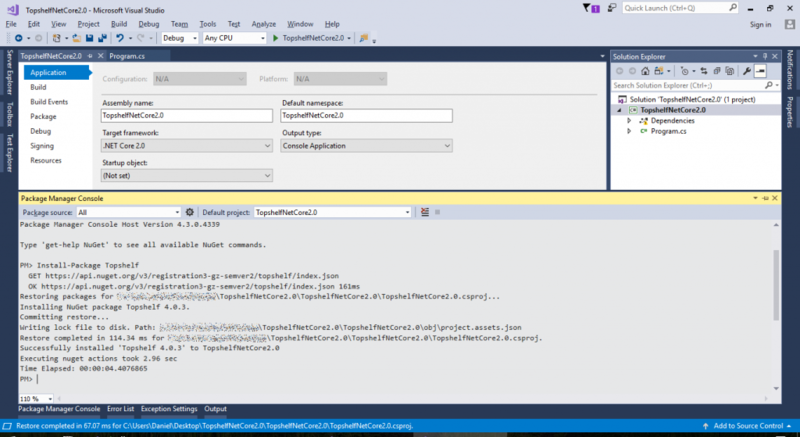 You can multi-target a .NET Standard library to include framework-specific functionality (guarded with preprocessor directives) while keeping the rest of the library compatible with all the relevant frameworks.